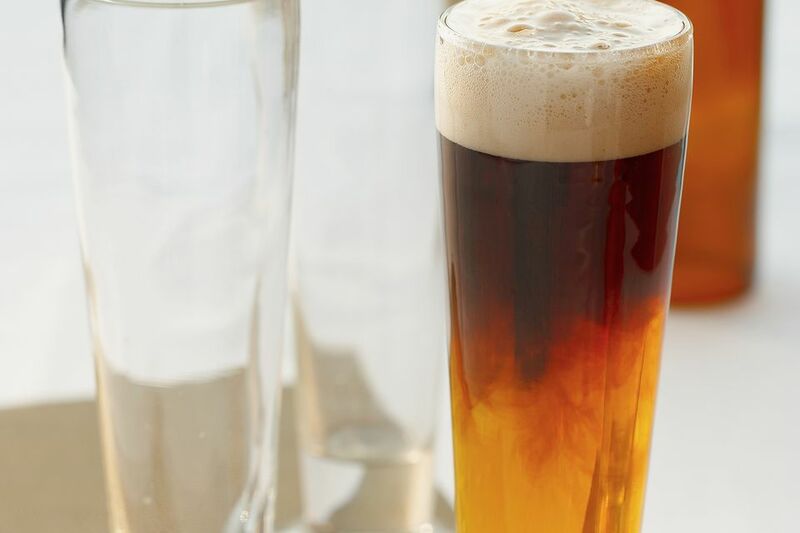 The black and blue beer drink is a brand-specific variation of the black and tan. Instead of a pale ale, Blue Moon is the layer underneath the Guinness. It's very easy to make and one of the best layered beer drinks for beginners. Blue Moon is a very well-known Belgian-style witbier (wheat beer) that has a refreshing citrus note and is highly effervescent, which is why it's a popular choice for summer. That is a complete contrast to the dark, dry Irish stout. If you've been looking for a way to enjoy Guinness on hot days, this is definitely a good option and the way the two beers marry in those middle sips is a very nice surprise. Pour the Blue Moon into a pint glass, filling it half-way. Float the Guinness on top to fill the glass, by slowly pouring it over a bar spoon (or black and tan spoon) over the Blue Moon. Many bars have stout on tap with a black and tan spoon attached to pour the Guinness over. But if you are pouring at home a bar spoon (or a regular table spoon) will work, the key to the layers is to slow down the pour. Be sure your beer is at your desired serving temperature before pouring. Using a frosty pint glass will help keep the drink cold as well. These two specific beers almost naturally want to form layers. However, it is not guaranteed if you switch brands. Unlike liquor that has a general specific gravity for the various styles, beer of the same style can vary in density from one brewer to the next. If you're thinking of swapping out the beer and want to find out if it will work before pouring, The Perfect Black and Tan website might have the answer. The "Guinness on Top" section is filled with tested beer combinations that layer as wonderfully as the black and blue. You can also take the black and blue to the next level and pour three layers of beer. One proven combination (according to that website) is New Belgium 1554 Black Lager on the bottom, Blue Moon in the middle, and Guinness on top. For this, you'll split the pint glass into thirds as you pour. How Strong Is a Black and Blue? The alcohol content of any layered beer drink will be the average of the two beers. There's no dilution or other ingredients to worry about, so the math is easy. In this recipe, Blue Moon is a 5.4 percent ABV beer and Guinness is 4.2 percent ABV, which makes the black and blue 4.8 percent ABV. What Are Good Beer Cocktails?